After 30 plus years of making knives I have 15 different models in my current catalog. And each year I make the same models over and over again. They are all easily recognized as "Bill Luckett Designs" without even seeing the Logo. These are the knives that I am known for, Large Sub-hilt fighters and Bowies. 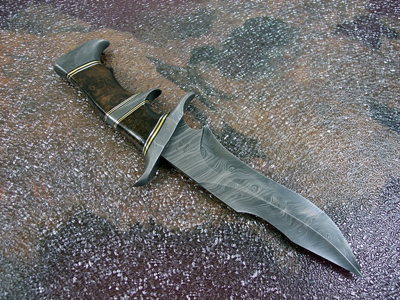 But I am always trying to come up with new designs, something different but still holding true to the Bill Luckett Style of Knife. So late in 2007 I decided to start the "1 of 1 Series". 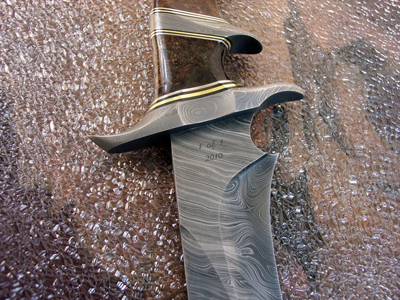 Each year I will make one or two knives that are not standard models as shown in my catalog. I want to do "Something Different, a One of a Kind". I try to expand my design and building capabilities and just see what I can come up with. I usually like to spend some time at the drawing table designing/drawing a full size picture of the knife. But sometimes an idea will hit me and I just make a quick sketch on anything available and then clean it up later when I have more time. So "The One of One Series" comes into being. Each knife will be a "One of a Kind" and will be marked on the blade "1 of 1". No two knives will be the same nor will it be something that you can place an order for. Each will be completed as to my design, I pick the handle material, blade steel, etc. Truly a "Luckett Custom Design". 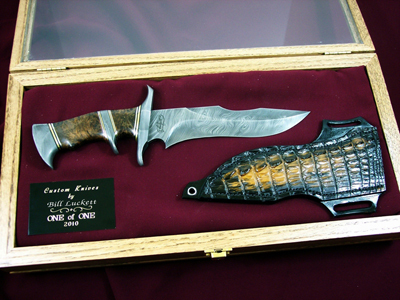 If you purchase one of these knives, you will have the only one in the world like it. If you are interested in having something special, a One of A Kind piece, you can contact me and see what is next for this series. I just finished the One of One for this year…2010. 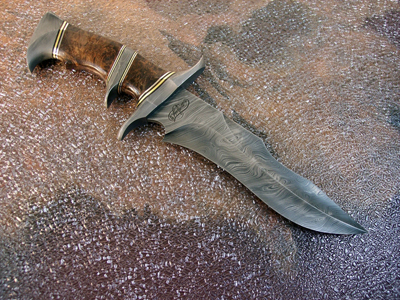 Something a little different in the handle material and some really interesting Twisted Damascus for the blade stock. 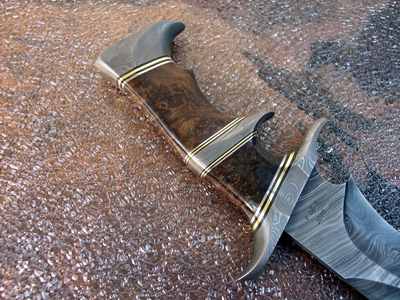 The handle material is some Stabilized Texas Mesquite Stump Burl. Really a lot of figure and grain in this stuff. Besides something about Texas Mesquite, hard as hell and you can’t get rid of it. 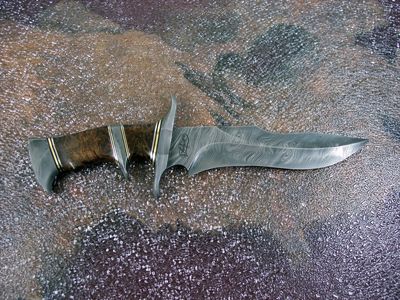 The blade is 8 ¼ inches long by 2 inches wide and made from ¼ inch stock of a great looking “Twisted Damascus Steel”. The top clip is sharpened. 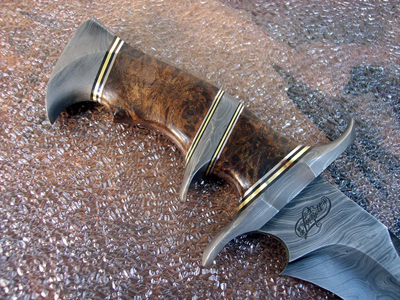 The guard, sub-hilt and pommel are a random pattern Damascus off set with black, brass and stainless steel spacers. This year I went for the ‘sheath option’ as well as a Custom Oak display case, in a table top style. The interior is maroon with a Black/Brass engraved plaque. 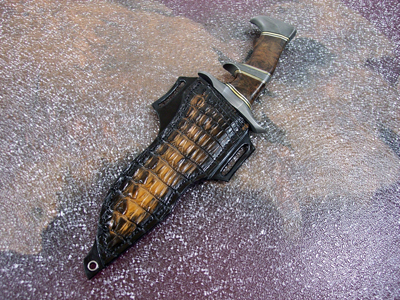 The sheath is a friction fit, High Ride Pancake Style with some Caiman Crocodile skin on the front. I dyed the sheath mostly black but leaving some of the brown in the croc skin showing. The price for this one of kind piece is $2200.00. 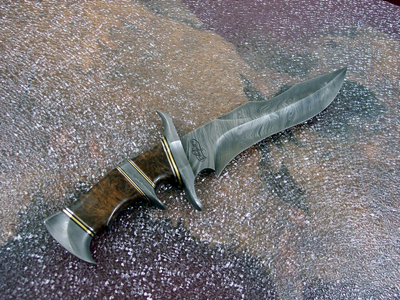 If you purchase this knife, you will have the only on in the world . It is truly a “One of One …. 2010” and the blade is so marked. Shipping and insurance will be the actual USPS cost, based on your shipping address. If you have any questions about this or any of my knives please contact me.